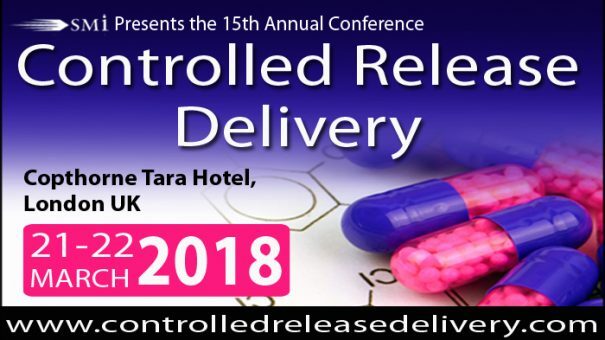 It gives SMi Group great pleasure to invite you to SMi’s 15th annual Controlled Release Delivery conference. Returning to London on the 21st and 22nd of March 2018, this year’s event is a unique and unrivalled opportunity where the industry comes together to discuss the latest innovations made within controlled release, debate the latest regulations and explore how to overcome current challenges together. With so much going on at this year’s event…can you afford to miss it? The agenda is packed with keynote addresses, expert speakers, informative content and senior figures from within the industry. Hear from the likes of Colorcon, Grunenthal, GSK, Ipsen, PLIVA, SiTech Pharmabio and more as we hold candid conversations on innovations in drug delivery, nanoparticles/nanomedicine & QbD, CNS drug delivery and therapeutic application. Keynote Address – Impact of the Current EU Guideline EMA/CPMP/EWP/208/96/Corr 1 on the Pharmacokinetic and Clinical Evaluation of Modified Release Dosage Forms of Generic Drug Product, Pavel Farkas of PLIVA. In addition, you will hear a number of other presentations covering subjects such as: Innovations and Advances with Peptides, Regulatory Considerations and Developing New Formulations. Opening Address – Emergence of 3D Printed Dosage Forms: Opportunities and Challenges, Mohamed A. Alhnan of University of Central Lancashire. Keynote Address – The Guardian Technology – Injection Molding of Tablets presented by Larsten Lindhardt of Egalet Corp. In addition to the above, there will be a number of other presentation covering topics such as: Advances in Coatings & Capsules and Utilisation of Technology & Nanoparticles.